Oct 13, 2015 in "Morimoto Asia"
Iron Chef Morimoto's latest restaurant is now open in The Landing district of Disney Springs, bringing a taste of the famed chef’s Asian flavors to Walt Disney World. There are two outdoor dining areas, an upper terrace that offers seating for the main table service restaurant and lounge, and a lower patio that will soon offer a quick service option called Morimoto Street Foods. You enter Morimoto Asia through a three story glass corner entrance where you are greeted by hostesses dressed in striking red, which is the perfect compliment to the otherwise mainly black and white color palette of the interior. Stepping inside gives you a first look at the expansive 36ft tall interior space. The restaurant feels very spacious and open, with the lower level main dining room having a full view of the upper level areas. On the ground level there is the open kitchen, which from behind a glass wall is a fascinating place to watch the kitchen at work. On the line, the brigade looks well-drilled and prepared, and the kitchen oozes cleanliness and high-end throughout. A rack of roasted ducks are proudly on display in the center of the kitchen. Elsewhere on the ground level there is the main dining room and a bar/lounge area. The dining room itself is split into smaller sections, which makes the large ground floor appear more intimate. There are a wide variety of tables in use - square, round, rectangular, booths - all in a variety of sizes from seating for two up to much larger sizes. It sounds perhaps a bit chaotic, but it all works and look spectacular. Each table is set with red chop sticks, crisp white linens with the Morimoto Asia logo in the corner, and a water glass tinged with red. With such a large open dining space in essentially a large warehouse, you might be wondering how the acoustics are. Although the restaurant is moderately loud when full, it never got to the point where you couldn’t hold a conversation comfortably. Many guests will probably prefer this type of ambiance vs a library-type atmosphere that falls on some high-end restaurants. On the second level is the Forbidden Lounge, which features the 14 seat raw bar. This area is first come, first served, and can be accessed from the main restaurant, or through its own private door opposite Raglan Road. A main central staircase takes you from the lower level up to the second floor bar and lounge, the dining areas, and the outdoor terrace. Once complete in early 2016, the terrace will provide some spectacular views out onto the water of The Springs. There is also a private dining room on the second level that can be reserved for functions. With the open floor place, the second level has views down onto the main ground level dining room. 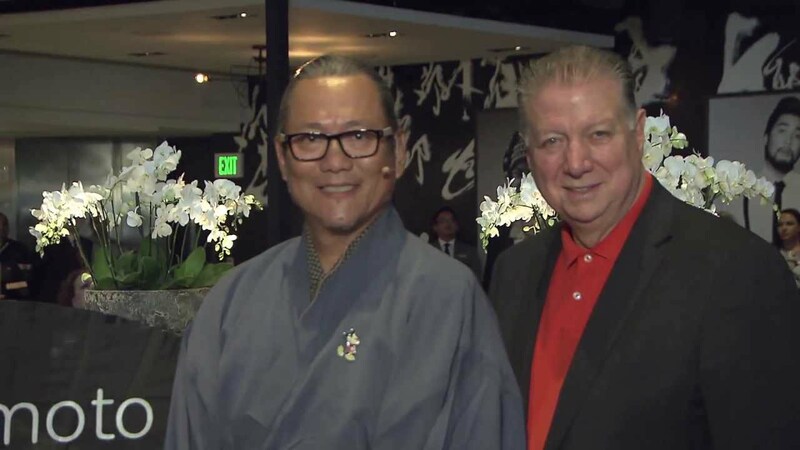 Morimoto is a big name in Asian cuisine, with his restaurants in Philadelphia, Chicago and NYC, all very highly rated. At Morimoto Asia, Chef Morimoto worked with the Patina Restaurant Group to bring Walt Disney World a new take on his cuisine. Those of you who are familiar with the other Morimoto restaurants will perhaps consider the menu to be playing it safe, which is less exotic than its city-based sister locations. But the intended audience here is different, Morimoto Asia must appeal to a family market at Walt Disney World, with many of those guests new to Asian cuisine. Morimoto Asia management use the term Pan-Asian to describe the menu. The menu is big in all regards - physically large, and with lots of options with something to suit everyone. There is a range of starters at around $15, including hamachi tacos, rock shrimp tempura, crab rangoon and Morimoto’s signature tuna pizza. Dim Sum offerings at $8 include a variety of dumplings and egg rolls. Moving closer to the Asian roots is a selection of sushi rolls priced around $10, including California, spicy salmon, shrimp tempura and spicy yellowtail. The Salad section has a calamari tempura, house green and duck caesar - all priced around $15. For the main course, the menu is broken down into meat + poultry, fish, noodles + rice and vegetables. There is orange chicken, filet mignon, rib eye, kung pao chicken, Peking duck, sweet and sour crispy bronzino, lo mein noodle, lobster chow fun, and much more. The entrees range in price from around $10 up to the mid $50’s. A surprisingly large dessert menu is on offer, with some really unique sounding dishes. A churro fondue, mm parfait, mochi-mochi, and chocolate cream crunch are among the options, all priced around $15. Many of the dishes on the menu are ideal for sharing, and this is perhaps the best way to handle the menu. Order a couple of items from each section of the menu to truly sample everything that Morimoto has to offer. If you looking for more sushi options, you can head to the Forbidden Lounge, which is the 14 seat sushi and raw bar on the upper level. This area has some of what is found on the regular menu, but with more emphasis on the raw bar, sushi and sashimi. A quick word on the kid’s menu for those of you traveling with little ones. For $12 you get a boba tea, a choice of entree and choice of dessert. It is great to see the kid’s menu offering something with a little interest - with options including a Japanese panko fried hamburger, lo mein, and orange chicken. On the recommendation of our server, we started out with one of Morimoto's signature dishes that can be found at a number of his restaurants, the Tuna Pizza. It is a crispy tortilla, with tuna sashimi, tomato, jalapeño and an anchovy aioli. It looks beautiful, and tasted even better. Vibrantly fresh, with a little bit of a kick - it served as the perfect appetizer to get started. It is an ideal dish to share, with around 6 small servings. Step into a Morimoto restaurant and you have to try some sushi, so we went with the Spicy Salmon Sushi Rolls. The heat is mostly in the mayo on the side, so don't be put off by the inclusion of spicy in the name. You get a choice of white or brown rice, and can add a tempura crunch for $1. Some of our group were not sushi eaters, but this one may have converted them. Up next was the chicken dumplings, with napa cabbage, chicken and scallions, along with pork egg rolls. Both were beautifully presented with flavors to match, The egg roll in particular was a favorite on our table. From the soup and salad section we picked the duck caesar - which is roasted duck, romaine lettuce, tomato, red onion, orange segments, walnuts and Morimoto caesar dressing. The dish was well dressed, not to heavy, and a good pick for a lighter entree or to share as a side with a main course. Moving to entrees, we tried the sweet and sour crispy bronzino, which is a Mediterranean sea bass, with Morimoto signature sweet and sour sauce. The fish is served whole, from head to tail, and is completely deboned. It is a stunning looking dish with taste to match. The fish had a perfectly crisp skin, and with a tender, flavorful meat. The bronzino is easily one of the best fish dishes in Walt Disney World, if not the best. And if you are feeling brave, the eyeballs are a delicacy in some countries! Rounding out our sampling of the entrees was the L.A. bbq kalbi, a marinated and grilled boneless short rib, served with a house kimchi and gochujang sauce. It wasn’t your typical fork tender short rib, much more like a steak. Perfectly cooked to a medium rare, and packing some heat from the sauce. The dessert line-up is really interesting and a welcome change from many restaurant's predictable dessert menu. All completely original, and as much design effort looks to have gone into these as the rest of the menu. We tried the Chocolate Cream and Crunch, which is a dark chocolate gelato with hazelnut crunch, topped with a mandarin orange jelly, and two oreo tempura cookies on the side. What a dessert! At $14 it is large, and like all the desserts, sized for two. The drink menu offers an assortment of sake, including the Morimoto signature line, plus a wine list showcasing wines of the world, signature cocktails and non-alcoholic drinks. The beers list offers mostly Asian varieties in both bottle and on draft, including the Morimoto signature beer by Rogue Ales. With the varied menu, the cost to eat at Morimoto Asia can fluctuate considerably. The dishes you saw in this review came to around $200 with tip, which puts the pricing on a par with most of Disney's signature restaurants. If you are dining on a budget, there are many dishes priced below $20, which could easily make a sub $100 night out for two. The restaurant does take part in Tables in Wonderland, which offers a 20% discount, but is not yet on the Disney Dining Plan. Morimoto Asia came to Disney Springs with a big reputation, and some big competition just steps away from its front doors. It did not disappoint. The restaurant is elegant, modern, high-end through and through, but manages to find a balance and remain family friendly which any restaurant at Walt Disney World must do. The food is imaginative in its design, extremely well prepared and presented, and offers something completely different to anything else you can experience at Walt Disney World. The menu is varied enough that everyone can find something they will like, and the more seasoned diners can venture onto things more exotic. Service was strong, with the restaurant being very well staffed with knowledgable and friendly servers. There isn’t a dress-code, but this is easily a restaurant where you can dress up and not feel out of place. Just like The BOATHOUSE that opened a few months earlier, we feel that Morimoto Asia continues to raise the bar for Disney Springs dining, and should be a must-do on your next visit. It comes highly recommended from us. Morimoto Asia is currently open for dinner from 5pm to 2am daily. You can make reservations via Open Table, and soon via My Disney Experience. Starting October 14 2015, the restaurant will be opening for lunch from 11am. A weekend brunch service is being added in the near future, along with Morimoto Asia Street Food - a quick service option. We’ll be back to try those once they begin, so check back for reviews. Morimoto Asia is located in The Landing district of Disney Springs, just across from Raglan Road, The BOATHOUSE and Jock Lindsey's Hangar Bar. View the gallery for more photos from Morimoto Asia. Note: Like all WDWMAGIC dining reviews, the visit was paid for by our reviewers, and was not part of any media event or tasting session.